After days and weeks of anticipation, we are finally at Christmas Eve! We hear the good tidings of great joy from the angels. With the shepherds, we run to Bethlehem, to the manger, to the Christ child! If nothing else, our hope is that spending Advent in the Psalter has broadened our perspective. Jesus doesn’t arrive unexpectedly in the New Testament, nor is his birth in Bethlehem a change in God’s thinking — a new direction. In Luke 24, on the road to Emmaus after his resurrection, “beginning with Moses and all the prophets, (Jesus) interpreted to (the two disciples) in all the Scriptures the things concerning himself.” For Jesus, the Scriptures were the Old Testament — and in the psalms, as in the prophets, we hear of God’s plan for the coming of Jesus, the birth of God’s own Son to be Savior and Christ. In the fullness of time, God sent his Son, and the psalms bear witness to it — as do all the Scriptures! This should give us great comfort and assurance that what God promises, he fulfills! The Bible would be nothing to us if God had not sent his Son, as promised. With the birth of Jesus, every promise, every word, every verse of Holy Scripture is trustworthy and true. As foretold, the King of kings, Lord of lords, Prince of peace has been born to us, and in that birth, we have hope for our future and the future of the world! In the midst of darkness there is light; in the midst of violence, there is peace; in a world of grief and loss, there is life — and abundant life! 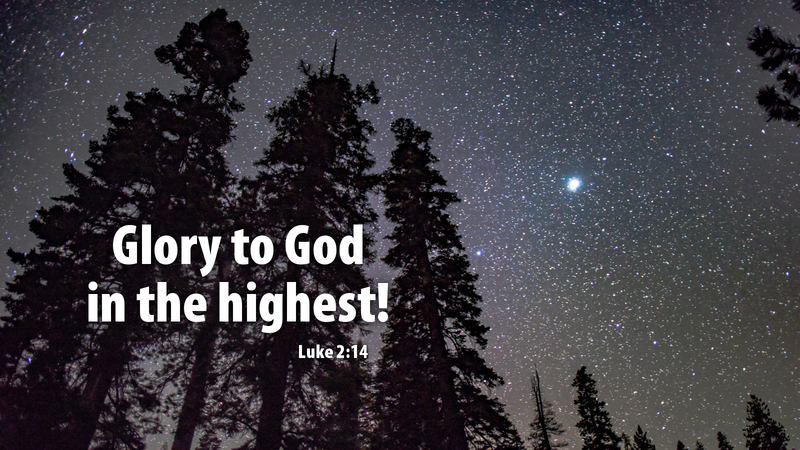 Glory to God in the highest! Gloria in excelsis deo!